Rebecca was ranked 897 in 2009 US male names list and elevated by 0.77% from its previous ranking of 904 in 2008. 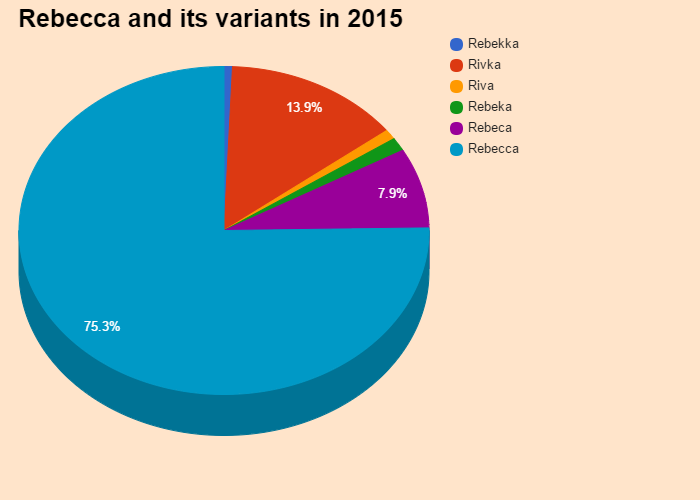 Rebecca was ranked 187 in 2015 list of US girls name and dropped by 3.31% from its previous ranking of 181 in 2014. Comes from the Hebrew "ribgah" Signfie "cow, heifer" If Day March 23.. On the first smiling, relaxed,Rebeccaare workaholics. Ambitious, voluntary, passionate,Rebeccamake every effort to ensure their professional success. Rebecca have many friends, but in reality,Rebeccaare independent and lonely women. Rebecca hate routine, never remain in place and conduct several projects at once. Intelligent, diplomats,Rebeccaknow how to ingratiate around them. Rebecca is a very very popular first name for a girl in England & Wales which is popular since 1996 and ranked 135 in 2014. Around 43287 people wear Rebecca as their first name. Rebecca is a very consistent name over the past 18 years. Rebecca is a very very popular first name for a girl in United States which is popular since 1885 and ranked 187 (0.043135% bearer) in 2015 in US. Around 745956 people wear Rebecca as their first name. Rebecca is a rare first name for a boy in United States which is a rare name since 1909 and ranked 187 (0.043135% bearer) in 2015 in US. Only 745956 people have Rebecca as their first name. Rebecca is not a native United States and Rebecca may be came from another language or is a short form of some other name. 0.208669% of people in US have this given name. Expression number of Rebecca is 1. Rebecca loves adventure and independence and possess determination and originality. Rebecca generally leads and direct others and likes to establishes their individual identity. Rebecca Abe Stephanie Fey aka Rebecca Abe German writer and illustrator. Get the meaning of Rebecca and celebrities who also shares the same name and some names related to Rebecca, english baby names list, list of names in english. Know what does Rebecca mean? This website serves as the extended english names list which will help in naming your child.